No, we’re not advertising for PNC. But they are – on the side of their headquarters building in downtown Pittsburgh. They recently finished installing what is said to be North America’s largest living wall. 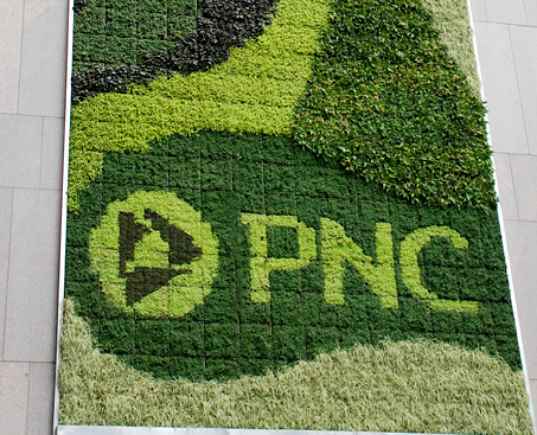 Designed by Kari Katzander of Mingo Design and made possible with the expertise of Green Living™ Technologies, PNC’s living wall is not only beautiful, but should help reduce energy use as well. This spectacular vertical garden is impressive in size as well, and is roughly the size of a doubles tennis court! Check out a pic of the full wall after the jump. The 2,380 sq foot living wall is soil based and includes many regional plants, all acquired locally within 500 miles of downtown Pittsburgh. The living wall system, which is made up of 602 2×2 ft square panels, is anchored directly into the reinforced concrete masonry on the south facing wall. Cenkner Engineering Associates of Coraopolis, PA and BD&E Strategic Branding and Design of Pittsburgh provided engineering and additional design. So far, the panels are reducing the temperature of the building, with preliminary studies showing that the wall behind the panels is 25% cooler than ambient temperatures. Watering of the living wall is expected to be minimal, with 15 minutes of watering per week via an internally controlled irrigation system, and when fully saturated, the wall will weigh 24 tons. The 8 varieties of plants are actually evergreen, meaning they should remain green throughout the year with some even flowering in the spring. In addition to their living wall, PNC recently completed a new park around the corner full of drought resistant plants and has many LEED certified branch locations throughout the US. They may be a big corporate business, but they definitely know how to do good green design. No, we're not advertising for PNC. But they are - on the side of their headquarters building in downtown Pittsburgh. They recently finished installing what is said to be North America's largest living wall. 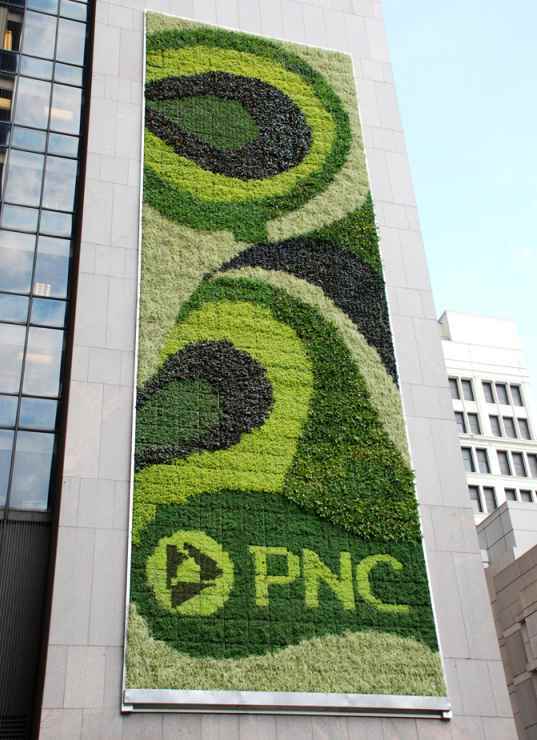 Designed by Kari Katzander of Mingo Design and made possible with the expertise of Green Living™ Technologies, PNC's living wall is not only beautiful, but should help reduce energy use as well. This spectacular vertical garden is impressive in size as well, and is roughly the size of a doubles tennis court! Check out a pic of the full wall after the jump.